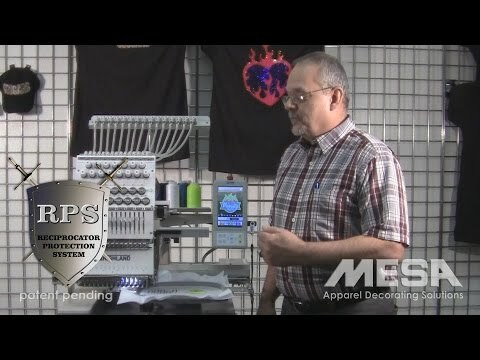 MESA Distributors is proud to announce a revolutionary change exclusive to Highland embroidery machines: the patent-pending RPS Reciprocator Protection System. If you've ever broken a reciprocator by hitting a hoop while embroidering, you understand why we're so proud to now offer Unbreakable Reciprocators. MESA's innovation has solved an expensive problem that has existed with embroidery equipment for decades. 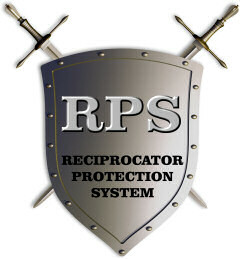 What is the Reciprocator Protection System? Embroidery machines drive the needle up and down via the needle bar. The machine transmits drive to the needle bar via a component called the reciprocator. In the event a needle/needle bar strikes a hoop or cap frame while embroidering, damage to the reciprocator occurs. The reciprocator is plastic and is designed to break away so that further damage is minimized to the embroidery machine main drive components. The problem with that technology is that this "hoop strike" disables drive to the needle bar and renders the sewing head useless. Customers can attempt the repair themselves by removing the sewing head (needle case) and replacing, adjusting, and reassembling all components successfully or they must pay someone for the repairs. In the meantime, they are completely inoperable until that sewing head is restored. Welcome to a new era of embroidery! The RPS solves an age old problem! Now, you can continue production even after striking a hoop! Now, the reciprocator does not break which disabled drive to all needle bars but instead a drive post to the needle bar breaks away. This disables one needle as opposed to the entire sewing head. The equipment owner still has the option to perform a repair themselves or pay a technician but they can do this at their convenience. Simply reset the machine, clear the broken post, change to a different needle, correct the garment and continue production in a matter of minutes. The RPS changes the status of being completely down for days at a time, to one of unnoticeable impact to production as it allows you to run embroidery while hardly missing a beat. No one ever intends on striking a hoop and sure, there are measures in place to avoid this. However, anyone who has ever experienced this dreadful situation will appreciate this new system. The RPS can save unexpected down time which saves you money! So, we ask you to compare between technology of the past and our new solution to this soon to be outdated problem. Watch the following video on how to replace a reciprocator here.